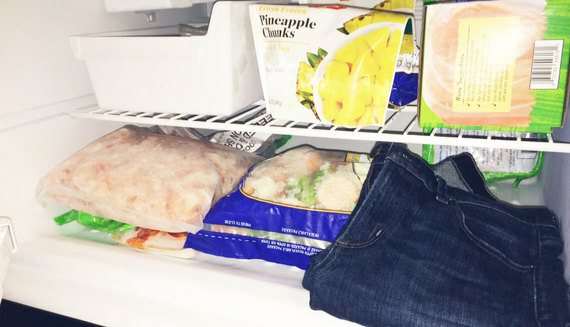 Should You Put Your Jeans In The Freezer Instead Of The Wash? It's time to bust this Internet fashion myth wide open. Denim lovers are on a constant quest to find the best way to clean their favorite jeans without ruining their integrity. Washing in a machine can cause dyes to run, and dryers can stretch the fibers out of shape. But can putting your jeans in the freezer for a few hours solve your denim problems? After each wear, bacteria from the skin is deposited onto the fabric of your jeans. Skin bacterias aren't harmful, but they can cause odors over time. This freezing hack seems to be the most popular denim cleaning alternative on the Internet. The logic: Cold temperatures would supposedly kill all the bacteria. And many people have tried freezing their jeans and found that the smell does go away, but scientific facts disagree with the water-free trick. It has been proven that bacteria doesn't die when frozen, it only becomes dormant. As soon as they are thawed out, the microbes become active once again. The BBC reports that scientists were able to bring a 30,000 year old virus back to life. How is it possible for bacteria to survive such extreme temperatures? Researchers at LSU experimented on bacteria that appeared to be dead from Siberian permafrost. After close observation in five-degree Fahrenheit conditions, they noticed that the DNA began to piece itself back together over the course of two years. Your freezer is not as cold as Siberian permafrost, so the reaction will happen faster. If you really want to kill bacteria, it will die when it is heated 165 degrees Fahrenheit. And just a note: The hot cycle of washer machines will typically heat up to 120 degrees Fahrenheit, while dryers reach around 135 degrees Fahrenheit. So, technically it's tough to completely kill bacteria. Luckily, the microbes from skin and sweat are generally harmless. The better alternative is to just wash your jeans less often. You don't have to clean your jeans after every single use. Levi's Global Vice President of Women's Design Jill Guenza tells SELF, "Jeans worn repeatedly without washing take on the character of the person wearing them." This is a good idea for achieving the perfect lived-in fit. But what about stains? "[Try] spot cleaning and air drying your jeans. Not only will this preserve the color, but it saves energy and water, so the impact on the environment is minimized," says Guenza.